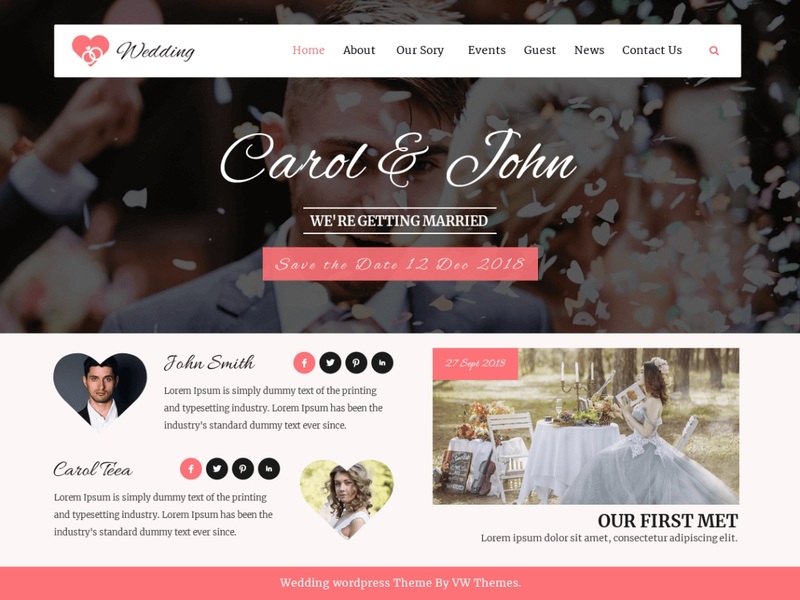 VW Wedding is an elegant, clean and sophisticated responsive WordPress theme dedicated to couples for designing beautiful engagement and wedding websites. It can also be used for anniversaries, birthday parties, family functions, wedding bands or for art and design website. You can design a portfolio out of it to make your journey of love all the more memorable. It is a feature-rich theme with a gorgeous layout. The very base of the theme is built on a Bootstrap framework which makes the theme very handy and easy to use. It is mobile-friendly and cross-browser compatible. It facilitates you to invite guests in your native language as it is translation ready, WPML compatible and supports RTL writing. The theme is customizable to give it a personalized touch. You can use banners and sliders to make the site more impressive. It has a user-friendly interface for smooth navigation. It is made SEO-friendly get higher rank for your site. With social media icons, you can reach your friends and relatives in just a few clicks. The theme is optimized for faster speed to give a good user experience. It has various sections and custom post types to organize your content in a variety of ways.